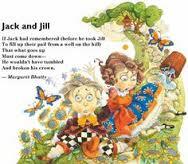 Jack and Jill went up the hill To fetch a pail of water; Jack fell down and broke his crown, And Jill came tumbling after. All the kings horses and all the kings men. Put it in the oven for Tommy and me. Rock-a-bye baby, on the tree top!